Feature: Free of common chemical irritants such as dyes, fragrance, masking fragrance, lanolin, parabens, formaldehyde, formaldehyde releasers, and other preservatives. • Free of common chemical irritants such as dyes, fragrance, masking fragrance, lanolin, parabens, formaldehyde, formaldehyde releasers, and other preservatives. • Alcohol-free. Sulfate-free. Phosphate-free. Gluten-free. 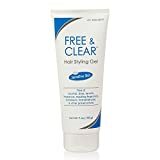 Free & Clear hair styling gel provides firm, long-lasting control without the use of common chemical irritants found in ordinary hair styling products. Holds hair in place without leaving greasy or sticky residue. Nourishes and repairs damaged hair, reduces flakiness, and adds body, leaving the hair manageable and static-free. Ideal for sensitive skin and scalps. • Free & Clear Set, includes Shampoo-12 Oz and Conditioner-12 Oz - One each.